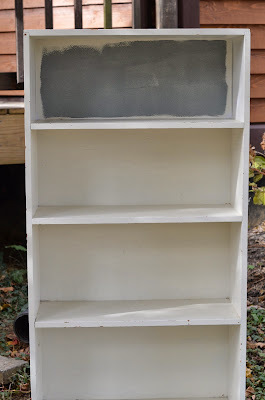 Got some old furniture in desperate need of a fresh makeover? I think this bookshelf has been hanging around since I was a tot, and the chipping white paint was starting to look awfully shoddy. To spruce this shelf up for a new look, leftover paint from one of our recent projects gave it an updated, neutral gray color that will better compliment our current style. 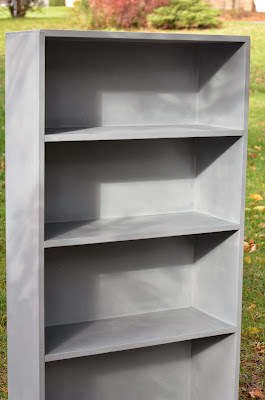 Leftover paint is ideal for revamping outdated furniture that might otherwise end up getting tossed. Now that I'm into it, I have about 4 more pieces in the lineup for a makeover. Loved this quick, easy and fun rejuvenation project! P.S. Here's a cool trick my fella taught me to make clean up a breeze. Instead of pouring paint directly into a tray, wrap the tray in a plastic bag first. When your job is complete, simply remove the bag and throw it away instead of scrubbing paint out of the tray. Easy peasy!